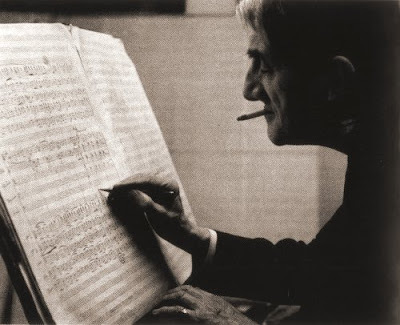 Sir John Barbirolli conducted the premiere performance of Vaughan Williams' Symphony No. 5 at Abbey Road. In fact Ralph Vaughan Williams himself conducted the premiere performance of his Fifth Symphony at a Promenade Concert on 24 June, 1943 in the Royal Albert Hall. Sir John Barbirolli's classic EMI recording of RVW's Fifth, one of the great achievements of the gramophone capturing one of the great achievements of twentieth century symphonic writing, also happened elsewhere. It was made in May 1962 in the Kingsway Hall. My header photo shows Glorious John in the Kingsway Hall control room marking his score at the final climax of the Passacaglia of the symphony during the sessions. Searches indicate that his account of the symphony has been deleted by EMI (not so, see comments below): is it just Abbey Road that is at risk? And talking of risk, read about what happened to the Kingsway Hall. It seems I am wrong and Sir John Barbirolli's recording of RVW 5 is still available from EMI, both as part of a 10 CD box and as a single CD. Many thanks to the ever vigilant Keith Hobday from Prelude Records who never stops working, even on a Sunday. Interesting that within just 12 hours of adding the comments above the EMI Barbirolli 10 CD box went out of stock at amazon.co.uk.